Make recycling bins easy to access. Think about it, the most common reason that recyclable items end up in our trash bins is due to the fact that they are conveniently located in our kitchen whereas our recycle bins might be in an inconvenient place such as hidden under the stairs or in our backyard. Thus, by establishing our household recycling center next to our indoor trash bin we can ensure maximum recycling. In the recycling center that you will establish make sure to have three different bins to sort out paper, plastic and glass easily so as to avoid once again the temptation of the trash bin. Read careful your local recycling company leaflet and get to know what is recycled and what’s not. Different companies have different set of items that you can recycle. Moreover, keep this leaflet somewhere handy i.e. on your refrigerator. 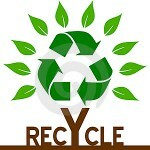 Promote recycling by making sure that the items you buy are recyclable. This way you can increase your recycling and reward manufacturers for taking the extra mile of producing recyclable products. These five simple recycling tips are not hard to implement and if we all follow them they can easily have a positive impact on our carbon print. Furthermore bare in mind that is the last R in the 3 R loop of reduce, reuse and recycle therefore you should first try to implement the first two steps before recycling in order to make the planet more sustainable.